The National Bureau of Statistics (NBS) announced recently that even though economic growth had dropped in 2014 to the lowest for 24 years (7.4%), 13.22 million jobs had nonetheless been created. For the moment, that’s why Beijing doesn’t seem that bothered about the slowdown in GDP growth. But this may be hanging in the balance. China lacks a robust system for recording employment and unemployment, and neither figure prominently in macroeconomic planning and management, overshadowed as they are by other quantitative targets. This aside, China didn’t have to worry about jobs much when the economy was growing like gangbusters, or even just a few years ago when nominal GDP growth was racing ahead at 15% per annum. Since then, though, things have changed. Real GDP growth has slowed to 7% or so momentarily, and nominal GDP growth is barely higher as deflation pervades the industrial sector and threatens to exacerbate the debt consequences of excess capacity. 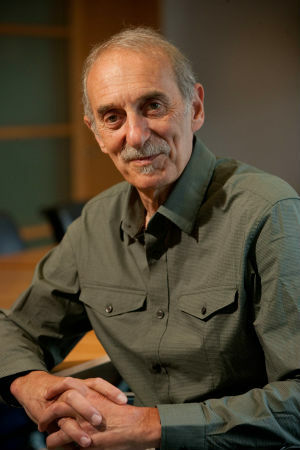 As a result, monetary, financial and regulatory policies were relaxed in the closing months of 2014, and we should expect more of the same in 2015.There is almost certainly a lower limit to growth, at or not too far away from 7%, where official concerns about unemployment and stability will increase — mainly because of the risk this could pose to social stability against a backdrop of a rising level of strikes and other labour unrest. These concerns are underpinned at a time when China still has surplus labour, that is, those who are unemployed, under-employed, and able and willing to work but are not in the labour force for whatever reason. The IMF reckons the surplus amounts to about 150 million people in a working age population (15-64 years) of about 1 billion. As the economy is experiencing a secular decline in real estate, construction and capital investment and credit intensity, it is highly likely that the maintenance of stability in China’s labour market is going to become more demanding. And while this has social implications everywhere, it is of particular significance perhaps in China. The irony is that most remedies would probably take the form of job creation in the state sector — precisely not what economic rebalancing calls for. 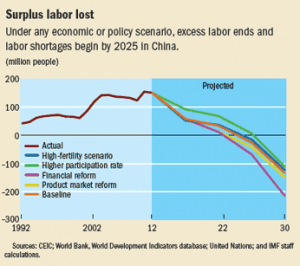 By 2020-2025, China’s surplus labour is going to shrink to the the point of elimination, partly and importantly as a consequence of rapid societal ageing. Various scenarios shown in the above IMF chart come up with different points at which the surplus is exhausted, but without altering the outcome in any way. The speed of ageing in China, in passing, is the fastest on the planet. By 2040-2050, measured by the old age dependency ratio, China will be one of the oldest countries in the world — certainly older than the US. 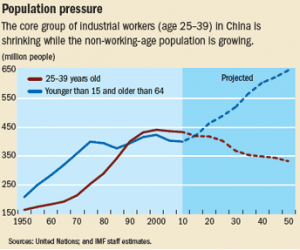 At the end, there’s a short primer on China’s demographics, which will bring new economic and social challenges, some of which are already starting to appear, for example, labour and skill shortages, and rising pressure on wages and salaries. 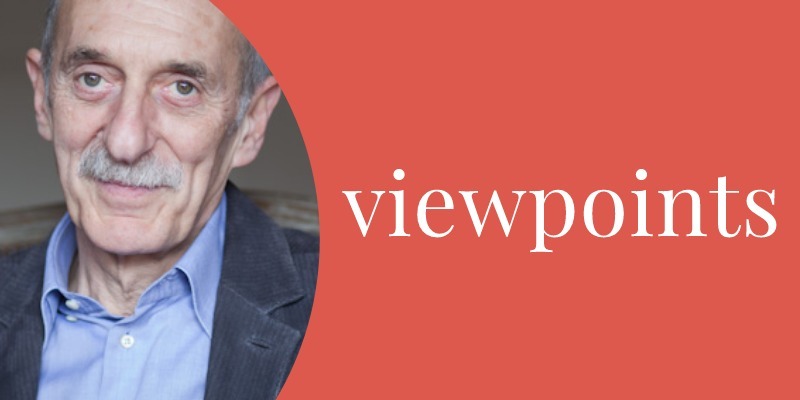 These medium-term developments underscore the necessity and urgency of economic and political reforms to change the way China’s economic model works, and to boost productivity growth — except that political reforms are, of course, not on the agenda, and in their absence, economic and governance reforms may, therefore, only get China so far. Like a lot of other emerging markets, the quality of China’s labour market data is sparse and poor. The NBS reports that about 767 million workers were employed in 2013, and that new urban job creation has been running at about 12 million a year on average since 2007. Official statistics are opaque or not published and have pinned the unemployment rate at 4% for the past 5 years, and in a tight range around that for over a decade. These numbers are “flattering”. The official publication of survey evidence recently suggests the rate of unemployment is around 5-5.2%, while a research study undertaken in 2012 by Southwestern University of Finance and Economics in Chengdu suggested it was nearer 8% then. Subsequently, we would imagine it has risen if anything. Unfortunately it is impossible to tell. On the one hand, China’s economy today — 2.5 times as big as it was in 2007 — can create more jobs even with slower growth. Labour transfer to more labour-intensive services has been proceeding, helped by new administrative reforms that have helped to lead to a significant rise in new business registrations, many in the services sector. By 2012, the distribution of workers had changed with the share of tertiary sector workers rising to about 36%, compared to 27.5% in 2000. Moreover, demographics are helping China as the number of people, aged 15-24, entering the labour force is slowing down, or declining, thereby keeping job creation pressures contained — at least for this age group. On the other hand, there is a potentially large pool of labour in the secondary or industrial and construction sector that could add to surplus labour and unemployment in the next few years. The share of secondary sector workers rose by nearly 8% between 2007-2012 to 30.3%, but the outlook is murkier as real estate, construction and capital investment continue to slow down. It is estimated that China’s construction industry employs about 70 million workers, compared to 50 million in 2008, and that 40 million are vulnerable migrant workers. This sector looks ripe for a contraction in the next two years. Few of China’s 275 million rural migrants to urban areas make it anywhere near to the official unemployment statistics, which only include urban workers — and not all of them —registered as unemployed. In 2008, 20 million migrants left their jobs and urban homes to return to the countryside without registering anywhere in official statistics. In addition, anecdotal reports suggest that China’s 7 million annual throughput of college graduates is finding it increasingly tough to find work, or appropriate work because of weakness in the number of jobs requiring college skills. In Beijing in 2013, 229,000 graduates came on to the job market, but only 98,000 graduate jobs were on offer. Last but not least, the China Labour Bulletin argues that there is a growing problem of job availability for un- and semi-skilled older workers in their 40s and 50s. This also affects migrants because the second biggest age cohort of migrant workers are those in their 40s. Older workers face job and wage discrimination in factories, they tend not to be accepted for training, and they increasingly have to find lower paid and irregular work in small family enterprises or as security guards, sanitation workers, hospital porters and so on. All of this underscores the importance of job creation as the economy slows down. So far so good, but the lagging status of employment and unemployment data, and the sparse and inadequate nature of the data that are collected, do not offer great cause for comfort. China’s labour market is likely to weaken and become an increasing focal point if GDP growth does what the IMF is predicting — 6.8% in 2015, and 6.3% in 2016 — or, more likely, overshoots on the downside. 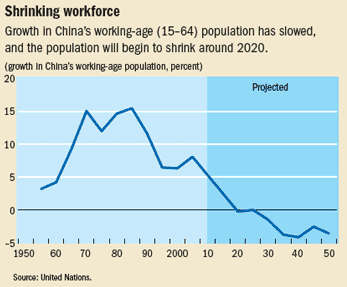 China’s slowing working age population, per se, will help to limit the influx of new workers, as in other ageing societies. In the aggregate, this has implications for (lower) trend economic growth unless China can offset via higher total factor productivity growth, for labour supply (shortages) and for income distribution (relative rewards accruing to labour at the expense of capital). But the issue is more likely to be the matching of skill demand and supply throughout the occupational structure of the labour force. China, like others, will develop an overall labour shortage, but with a variety of surpluses and deficiencies distributed largely, one imagines, according to skills, education and training. This second IMF chart shows the predicted overall slowdown in the working age population through 2020 and beyond. This trend is the product of rapid ageing, i.e. the unique combination of weak fertility — certainly sub-replacement rate — and rising life expectancy. The outcome is a relentless rise in the old age dependency ratio, measured by the number of over 65 year olds relative to the (shrinking) working age population. Today, China’s ratio is about 10%, or about 10 workers for each person aged over 65, but it is headed to 40% or 2.5 workers by mid-century. We can also see the effects of rapid ageing by looking at the next IMF chart showing the numbers of 25-39 year olds, and those of dependent age, i.e. under 15 and over 65 years. As the latter rises, of course, the dependent are exclusively older citizens. higher fertility rates, which China has sought to remedy recently by relaxing the one child policy but without significant effect. This is not surprising since the one child policy had a much greater impact on gender imbalance than on fertility rates. Countries with no one child policy, such as Germany, Russia and Iran have lower fertility rates than China.